The Edward C. Little Water Recycling Facility Phase III Expansion provides water to the Chevron Refinery. 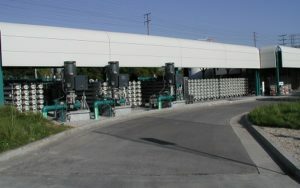 The project includes a 5.4 mgd microfiltration system treating secondary effluent followed by a two-pass RO system. The first pass RO system produces 4.6 mgd of RO permeate to supply low-pressure boiler feedwater to Chevron, as well as feed the second pass RO system, which produces 2.6 mgd high-pressure boiler feed water. SPI provided the technical specifications for the MF and the detailed design for the two-pass RO system based upon the pilot-scale demonstration of a two-pass RO system for production of high-purity boiler feed water also facilitated by SPI. Additionally, SPI provided construction services and startup services.